This HOMCOM belt tension exercise bike is an excellent way of working out to get your body in shape. Using an 8 level resistant system to control the tension, it provides adequate control to your fitness regime which can be controlled using the control knob. During your workout you can track your progress on the LCD screen in the form of speed, distance and calories have been burnt. 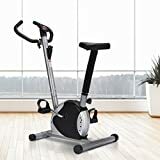 This is an excellent piece of fitness equipment to have and get the benefits of cycling without leaning the comfort of your home.